exchanged vows in September 1953. Father von Maluski explains that one reason for considering the detailed carvings to be of the likeness of Mary Magdalene is that she is described in Christian writings as the “apostle of the apostles” and the woman’s profile is set in the final arches in the rear of the Church building in the choir loft area, ending the series of 12 enormous arches, which feature the full facial sculptures of the 12 apostles. The mysterious discovery was revealed when the Church began dismantling its massive 1,674-pipe organ for shipment and refurbishment by the Casavant Frères Company in Canada. The restoration project is part of the St. Mary’s Souls in Harmony campaign to raise $1.2 million to preserve the church building and choir loft, restore the 1958 pipe organ and expand the music program into the community. Once the pipes and huge structure of the inner mechanics of the organ were removed, two of the same carved heads were revealed. Plans are now underway for casting molds of the works of art to preserve them for historical and religious purposes. Once completed, the Church will create a permanent display of the casts and incorporate the original organ pipes in a memorial to the St. Mary’s Music Ministry and as part of the Souls in Harmony campaign. 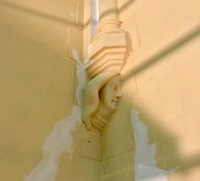 The casting work is being overseen by St. Mary’s Church parishioner Robert Russell, Ph.D., a Salve University professor in the Department of Cultural and Historic Preservation, Art and Art History. Professor Russell and six of his students are also conducting historical research to identify the woman as part of the University’s Spring 2017 Preservation Planning Studio program. Russell is also a member of the leadership committee of the St. Mary’s Church Souls in Harmony campaign. Source: Ryan Belmore, What's Up NewP, March 29, 2017.